Chalk another point for bad video game business. Today Black Rock Studios announced new DLC for Split/Second called "Survival at the Rock". 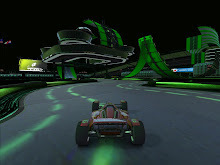 It looks to add a new track and new Survival Race mode. On gaming news sites and the facebook page, it is mentioned that the DLC is only available to the Xbox 360 and PS3 platforms, and I saw no sign of PC availability on the official website or in-game. Now, I took a screenshot from the trailer I saw, and you tell me, is this false advertising?!?! 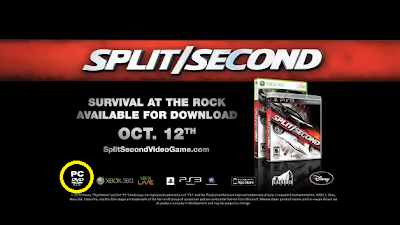 "SURVIVAL AT THE ROCK AVAILABLE FOR DOWNLOAD OCT. 12th"? So where is it?! Why, on 13 October 2010 do I not have access to this, nor is it mentioned anywhere else, except for Xbox 360 and PS3? I'm so tired of companies pulling this B.S. I could scream... If you're not going to fully support a platform for the entire game's lifecycle... DON'T FREAKING RELEASE ON IT TO BEGIN WITH!!! And seriously, if you're not going to release ridiculous DLC for a given platform... DON'T FREAKING LIST IT AS ONE OF THE AVAILABLE PLATFORMS!!! No GG on this one guys; as PC Gamers once again get the shaft... unless someone can correct the error of my ways and link us somewhere that we PC gamers can go acquire said content. If someone can, I'd be very appreciative.